Andrea Cevasco-Trotter sings to a premature baby with one of her students. It’s not uncommon for babies in the neonatal intensive care unit, or NICU, at DCH Regional Medical Center to weigh less than three pounds, or little more than a bottle of water. With infants less than 28 weeks of age, their lungs aren’t fully developed, and the very thing keeping them alive—breathing machines that force oxygen into their lungs—can also cause significant damage over time to their lung tissue and vision. Lowering supplemental oxygen levels even slightly can have tremendous positive effects on these babies. How do you lower supplemental oxygen? By increasing the amount of oxygen that these babies absorb. How do you do that? In some cases, play music. Time and again, Dr. Andrea Cevasco-Trotter and her students have seen music therapy’s immense power to improve outcomes for premature babies as well as for dementia patients, the terminally ill, and traumatized adolescents. One of Cevasco-Trotter’s research studies, conducted in the NICU, showed that infants who received music therapy went home 14 days earlier than infants who didn’t receive music therapy. Board-certified music therapists use music in ways that are scientifically proven to help people of all ages with motor, cognitive, communicative, social, and emotional needs, Cevasco-Trotter said. The same is true in the NICU, but the stakes are much higher. Fluorescent lights, wires, dinging monitors, and other babies wailing intensify the effect. A professional certification is required for music therapists to work in these high-risk NICUs. 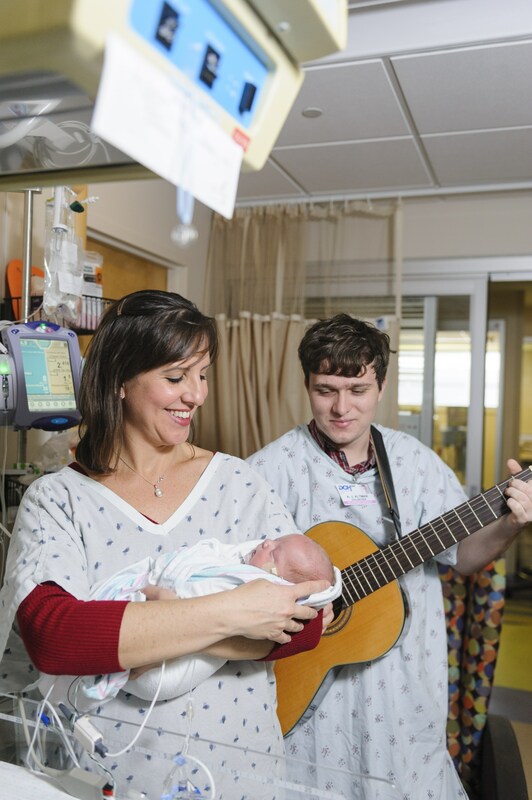 The University of Alabama is one of only 10 universities in the nation that offers this NICU certification through the National Institute for Infant and Child Music Therapy at Florida State University. “Students love it because most undergraduates do not get to go into neonatal intensive care units as part of their clinical training,” Cevasco-Trotter said. UA students who are trained to conduct music therapy in the NICU learn about the consequences of adding to premature babies’ stress levels, to recognize the signs of stress, and how to respond to those signs during the therapy session. As Cevasco-Trotter said, the NICU is stressful enough, and music therapy shouldn’t make it worse. With just a few minutes of singing and strumming a guitar, they’ve seen babies’ heart rates drop from a near-alarm-dinging 190 to a manageable 170. Scrunched up fingers and faces also relax, another sign that the babies are no longer stressed. The greatest benefits, according to her research study, have been in babies with very high heart rates. Concurrently, Cevasco-Trotter is working on two studies involving older adults. One investigates music preferences for different age groups, breaking up music by decade. Though it’s widely known in music therapy that patient-preferred music works best, this presents a challenge when music therapists work with large groups of people, which is often the case at veterans’ hospitals and nursing homes. Though they are still gathering and analyzing data, preliminary results show that older adults are unique regarding their thoughts on music from their young adult years. For music therapists who work primarily with large groups at retirement centers, dementia units, and assisted living units, her research has profound implications. “You could use songs from the 1940s, ‘30s, ‘20s, and ‘10s, and everybody will enjoy it, which will have the most impact,” she said. The second study she is working on compares the benefits of music, recreational, and reminiscing therapies for older adults with dementia. Specifically, she is comparing participants’ cognition, stress, and participation levels for each therapy type. Preliminary data has shown differences in cognition. In all cases, Cevasco-Trotter said she most enjoys interacting with patients. A former student, for instance, analyzed anger, stress, and depression in teenagers living in a juvenile detention center. The student found declines in all three emotional states in the teens who participated in music therapy. Interaction also drew Cevasco-Trotter to music therapy. When she started her bachelor’s degree at UA undecided on a major, she hadn’t considered studying music therapy because she thought it merely involved playing music for older adults. At Florida State University, where she earned her doctorate, she used music therapy to help new mothers bond with their premature infants, helping them to write, sing, and record lullabies that she played when the moms couldn’t be in the NICU. She suspects that what was true for her is also true for her students—clinical work often solidifies a student’s decision about their chosen field.